Submitted 1.5 plates for Sanger sequencing. Dungan isolates prepared by me, Lake Trout HRM prepared by Rony and Emma’s differential display cloning samples prepared by her. All primers were prepped by me. 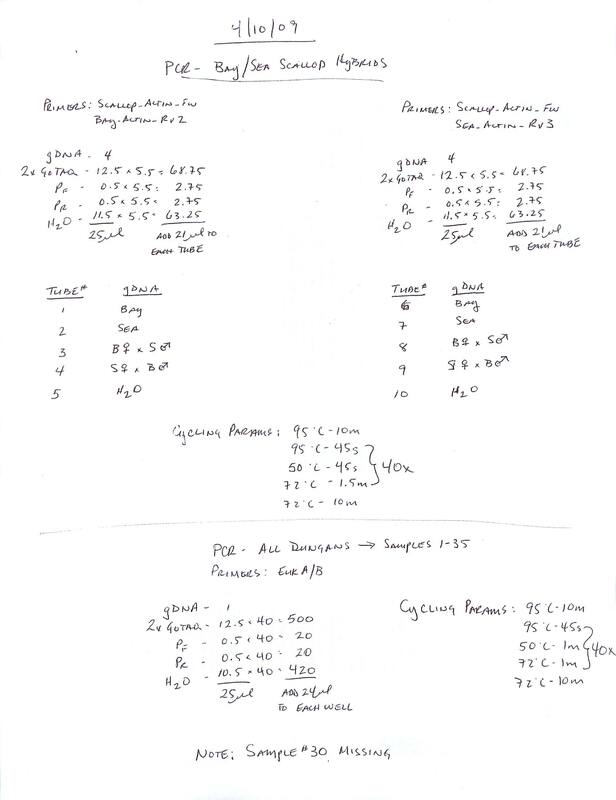 See the sequencing log for samples and plate layout. This entry was posted in Miscellaneous and tagged Dungan isolates, high resolution melt curve, HRM, lake trout, Sanger sequencing on 3 December, 2009 by kubu4. This is a repeat of yesterday’s set up with LABY primers, but with an annealing temp of 53C in hopes of improving the number of amplicons generated from additional samples. See yesterday’s PCR run for info on samples. Results: Samples were loaded 1-29 and three negative controls from left to right, top to bottom. The lower annealing temperature clearly resulted in more products. The ~500bp band was cut from each lane and stored @ -20C. All bands will be purified using Millipore spin columns and then sent for sequencing. This entry was posted in Miscellaneous and tagged Dungan isolates, gel, gel extraction, laby, lyons, PCR, Ultrafree-DA on 18 November, 2009 by kubu4. This was done on the numbered tubes using the LABY A/Y primers for eventual sequencing. Turns out many of the tubes have some info (other than just a number) on their sides which might provide more information regarding which isolate they actually are. PCR set up is here. Annealing temp 55C. There are four prominent bands from Tubes 23, 27, 28, 29. These four bands were excised and purified with Millipore spin columns according to protocol. They will be sent for sequencing. There are faint bands visible from Tubes 9 & 11. Due to the faintness, they were not excised as there may not be enough product for sequencing. The remainder of the samples failed to produce any amplicons. This entry was posted in Miscellaneous and tagged Dungan isolates, gel, gel extraction, lyons, PCR, Ultrafree-DA on 17 November, 2009 by kubu4. Submitted two plates for sequencing. Each sample two times from each direction. This entry was posted in Miscellaneous and tagged Dungan isolates, Sanger sequencing on 17 April, 2009 by kubu4. Repeat of yesterday’s PCR, but with AmpliTaq, less gDNA and 50uL rxn volume. PCR set up is here. UPDATE: Noticed on 20090713 that the reactions didn’t have dNTPs. Probably explains why it didn’t work! This entry was posted in Miscellaneous and tagged AmpliTaq, Dungan isolates, gel, PCR on 16 April, 2009 by kubu4. Used Euk A/B and LABY A/Y primers. Anneal temp 50C. PCR set up is here. 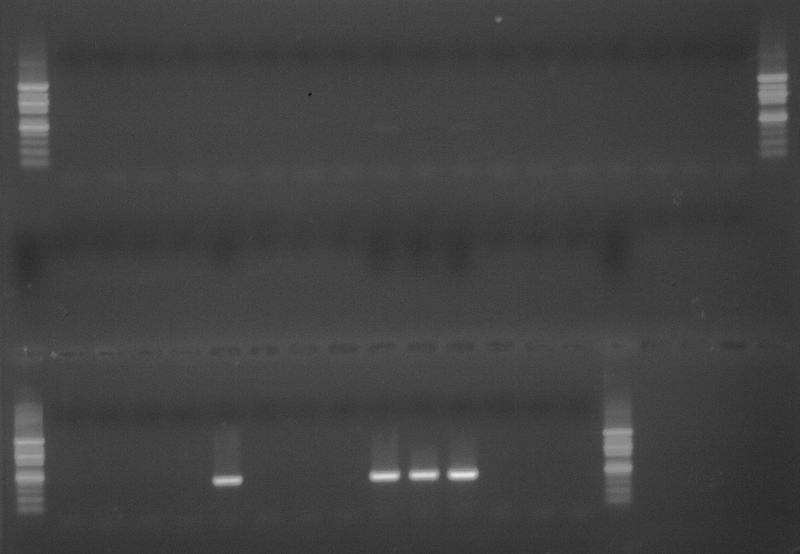 NOTE: Due to the extremely low concentrations of gDNA from these two samples, I used a large amount of gDNA in the rxns. Check the PCR set up link for actual numbers. Results: Nada. Probably because of low [gDNA], but could also be due to PCR inhibitors in the gDNA. Will retry using Amplitaq and less gDNA. This entry was posted in Miscellaneous and tagged Dungan isolates, Euk, gDNA, laby, MIE-14y, PCR, VNTc-1.2-C1/G10 on 15 April, 2009 by kubu4. Samples were spun @ 16,000g @ RT for 2mins. No visible pellets in either sample. EtOH was removed. “Pellets” were washed in 1x PBS (pH=7.6) two times and then the Qiagen DNEasy Kit protocol was followed. Samples were incubated @ 55C with Proteinase K for ~2hrs. Results: Both samples show really, really low quantities of gDNA. 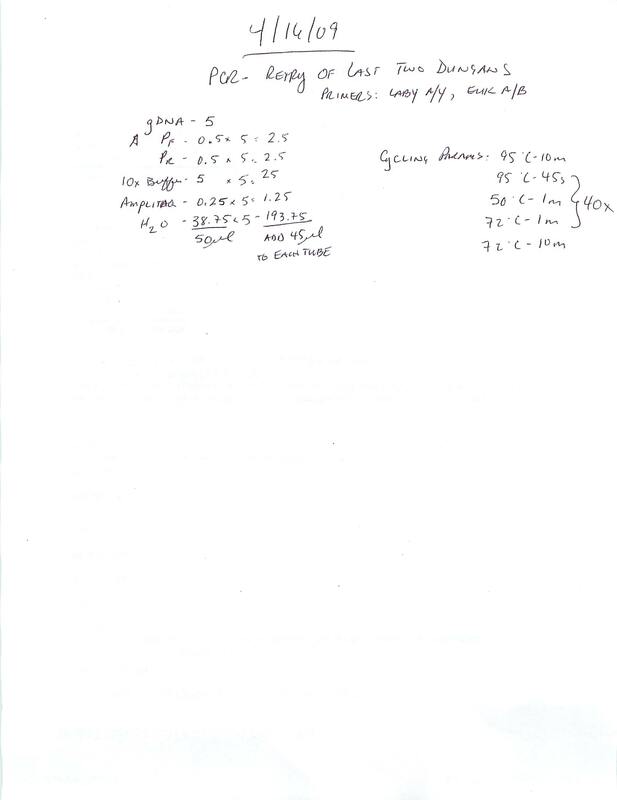 This entry was posted in Miscellaneous and tagged DNA Isolation, DNA Quantification, DNeasy, Dungan isolates, gDNA, MIE-14y, NanoDrop1000, VNTc-1.2-C1/G10 on 15 April, 2009 by kubu4. Steven had me re-PCR the old Dungan isolates with the new EukA/B primers. Anneal temp 50C. 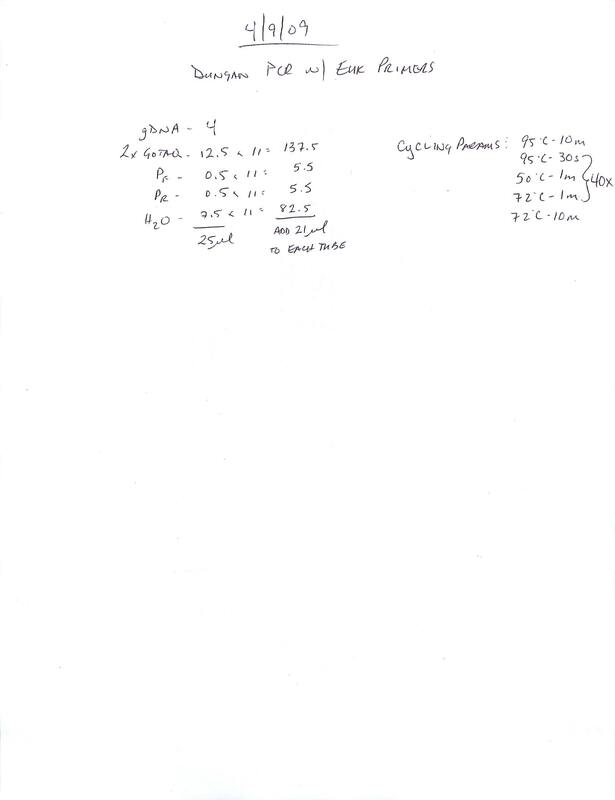 PCR set up here (bottom half of sheet) . NOTE: Sample #30 was not in the rack of tubes that Steven gave to me. This entry was posted in Miscellaneous and tagged Dungan isolates, Euk, gel, PCR on 10 April, 2009 by kubu4. 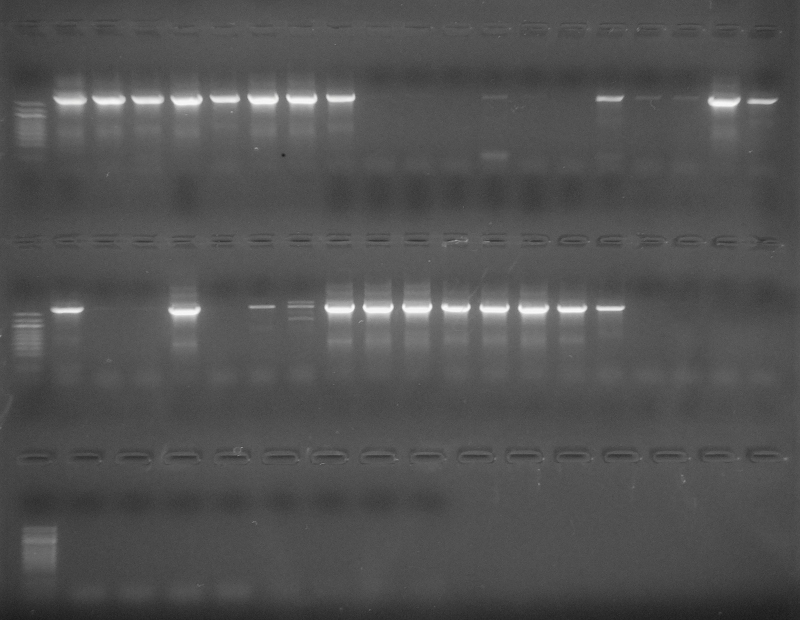 Did PCR with new Euk primers designed by Steven. Should be one step higher taxonomically. PCR set up is here. Aneal temp 50C. 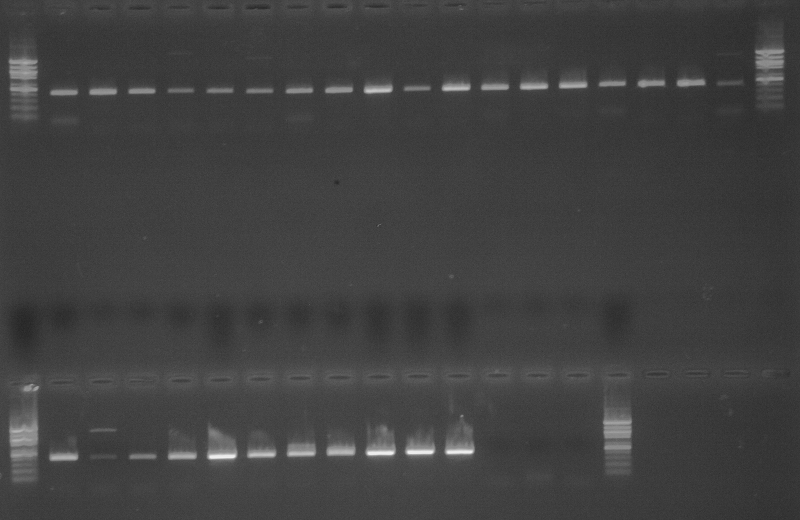 Results: The new EukA/B primers worked wonderfully. The brightest band in each lane was excised and purified using Millipore DA spin columns. These will be stored and sequenced at a later date. This entry was posted in Miscellaneous and tagged 1.2t, 1.5t, 11t, 12t, 13t, 17t, 19t, Dungan isolates, Euk, gel, gel extraction, H5, PCR, Ultrafree-DA on 9 April, 2009 by kubu4. 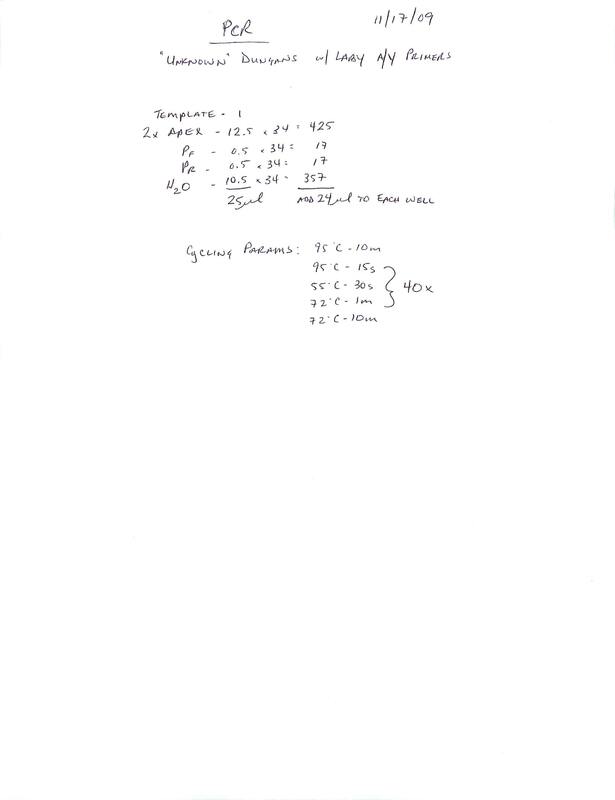 Repeat of PCR from 20090403, but using AmpliTaq and 50C annealing temp. PCR set up is here. Results: Nothing amplified! Possibly due to age of polymerase (? ); over a year old. Will wait to repeat for new primers to arrive (EukA/B). 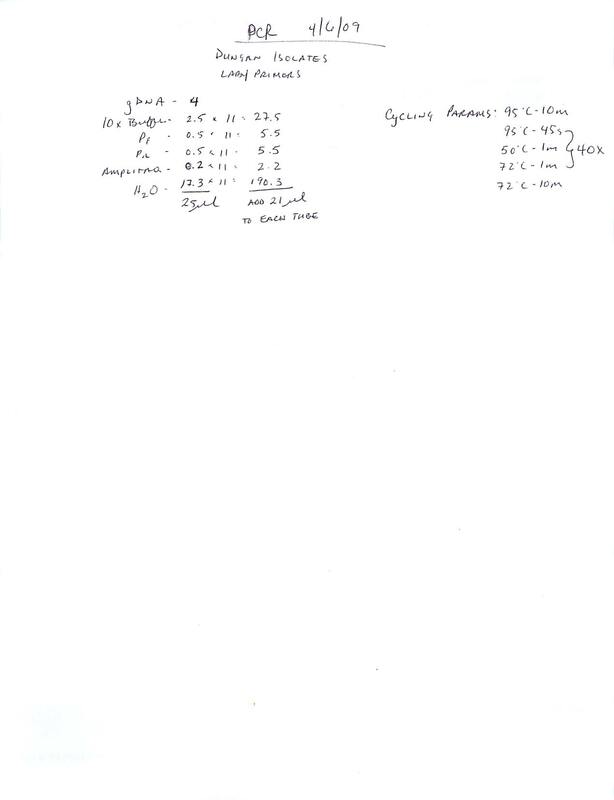 This entry was posted in Miscellaneous and tagged 1.2t, 1.5t, 11t, 12t, 13t, 17t, 19t, AmpliTaq, Dungan isolates, gel, H5, PCR on 6 April, 2009 by kubu4.